[PDF] Digital Design and Computer Architecture, Second Edition | Free eBooks Download - EBOOKEE! Description: Digital Design and Computer Architecture takes a unique and modern approach to digital design. 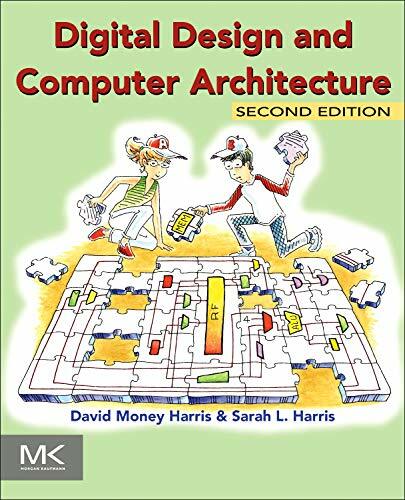 Beginning with digital logic gates and progressing to the design of combinational and sequential circuits, Harris and Harris use these fundamental building blocks as the basis for what follows: the design of an actual MIPS processor. SystemVerilog and VHDL are integrated throughout the text in examples illustrating the methods and techniques for CAD-based circuit design. By the end of this book, readers will be able to build their own microprocessor and will have a top-to-bottom understanding of how it works. Harris and Harris have combined an engaging and humorous writing style with an updated and hands-on approach to digital design. This second edition has been updated with new content on I/O systems in the context of general purpose processors found in a PC as well as microcontrollers found almost everywhere. The new edition provides practical examples of how to interface with peripherals using RS232, SPI, motor control, interrupts, wireless, and analog-to-digital conversion. High-level descriptions of I/O interfaces found in PCs include USB, SDRAM, WiFi, PCI Express, and others. In addition to expanded and updated material throughout, SystemVerilog is now featured in the programming and code examples (replacing Verilog), alongside VHDL. This new edition also provides additional exercises and a new appendix on C programming to strengthen the connection between programming and processor architecture. No comments for "[PDF] Digital Design and Computer Architecture, Second Edition".